The Cleveland Indians top Box-Toppers team rankings for the second straight week, though the Los Angeles Dodgers briefly retook the lead in the past week. Meanwhile, the Washington Nationals continue to lead National League teams for the second week and the Boston Red Sox are the hottest team of the past week. 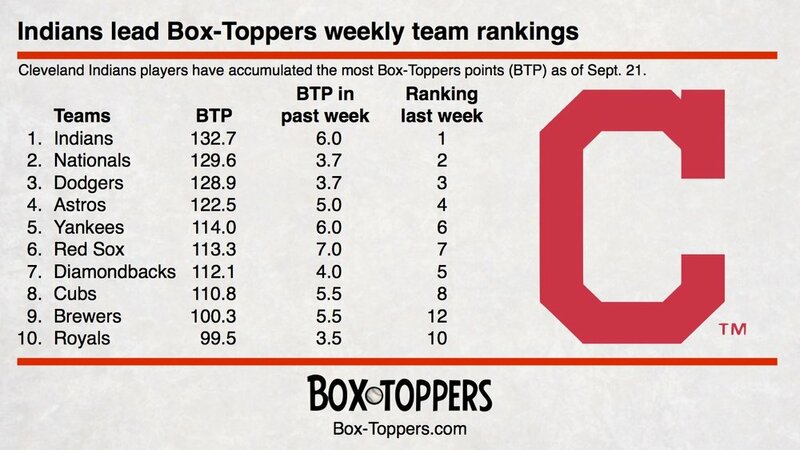 The Indians lead with 132.7 Box-Toppers points, picking up 6.0 points in the past week. The Nationals rank second with 129.6, first among NL teams, picking up 3.7 in the past week. The Dodgers rank third with 128.9, picking up 3.7 in the past week. The Dodgers were baseball’s run-away dominant team in late August. On Aug. 24, they were 11.9 points ahead of the Nationals and 21.8 points ahead of the Indians. While the Indians lead in players’ accumulated Box-Toppers point totals for 2017, they have baseball’s second-best winning percentage (.627), behind the Dodgers (.634). The Dodgers briefly retook the team rankings lead in the past week on Friday and Saturday, before the Indians took the lead back on Sunday. The Indians are led by pitchers Corey Kluber (21.0 Box-Toppers points, ranked fourth among all players) and Carlos Carrasco (19.8 Box-Toppers points, ranked eighth). Top batter is Edwin Encarnacion (12.1 Box-Toppers points, ranked first among AL batters). Twenty-three different Indians players have earned Player of the Game honors so far this season. The NL-leading Nationals are led by pitcher Max Scherzer (24.0 Box-Toppers points, ranked second). Top batter is Anthony Rendon (8.0 Box-Toppers points, 10th among NL batters). Twenty-five different Nationals players have earned Player of the Game honors so far this season. The Nationals have the second-best winning percentage in the NL (.605), behind the Dodgers (.634). The Boston Red Sox are the hottest team of the past week, picking up 7.0 Box-Toppers points, most of any team. The Red Sox now have 113.3 Box-Toppers points on the season, rising from seventh place last week to sixth place this week. The Milwaukee Brewers made the biggest rise up Box-Toppers team rankings this week, rising three spots from 12th to ninth place with 100.3 Box-Toppers points, earning 5.5 points in the past week. The Seattle Mariners made the biggest drop, falling three spots from ninth to 12th place with 96.3 points, earning no points in the past week. The Chicago White Sox remain the lowest-ranked team in 30th place with 34.1 Box-Toppers points, earning 2.0 points in the past week. 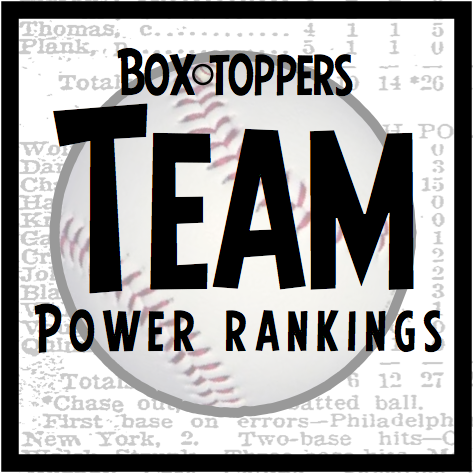 Next week—Box-Toppers weekly team and player rankings reports are normally posted on Fridays. Next week there will be no weekly reports posted on Friday, Sept. 29, since it is so close to the end of the season, Sunday, Oct. 1. Instead the weekly team and player reports will be posted after Sunday’s regular season final games, most likely on Monday, Oct. 2.